Opening the blinds in the bedroom this morning this amazing site awaited me, so I grabbed my phone to take a quick photo, then internetted it to see what was going on. 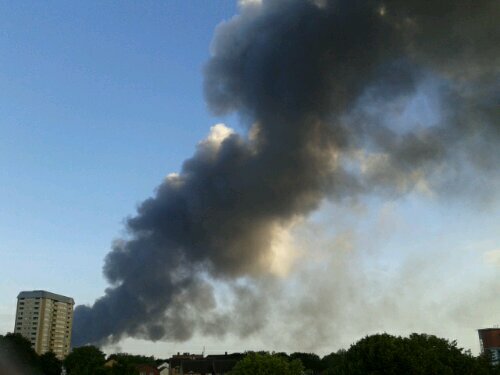 A factory fire in Smethwick, 200 fire-fighters and overnight police prescence. In the new office we have the radio on, so it turns out that it was a chinese lantern, like this one. Probably everybody in Birmingham that was playing with these last night are thinking “shiiiiiiiit!” We had them once in Derbyshire, they were lovely from the photos I saw – photos because the million mile walk had knackered me so much I was in bed by 10pm. This entry was posted in Life, Love and Football and tagged birmingham, chinese lantern, fire, jayplas, smethwick, UK. Bookmark the permalink.